Well, not quite, I mean it is a bright, cold day in April, but this beautiful wedding gown is the antithesis of 1984 dystopia. Much more a utopian dress; blissful, heavenly, idyllic even. 1930’s Glamour springs to mind. Elegance and femininity, think Jean Harlow and Greta Garbo. Ivory silk and chiffon. It’s a couture dress by an English designer called Sophie English. 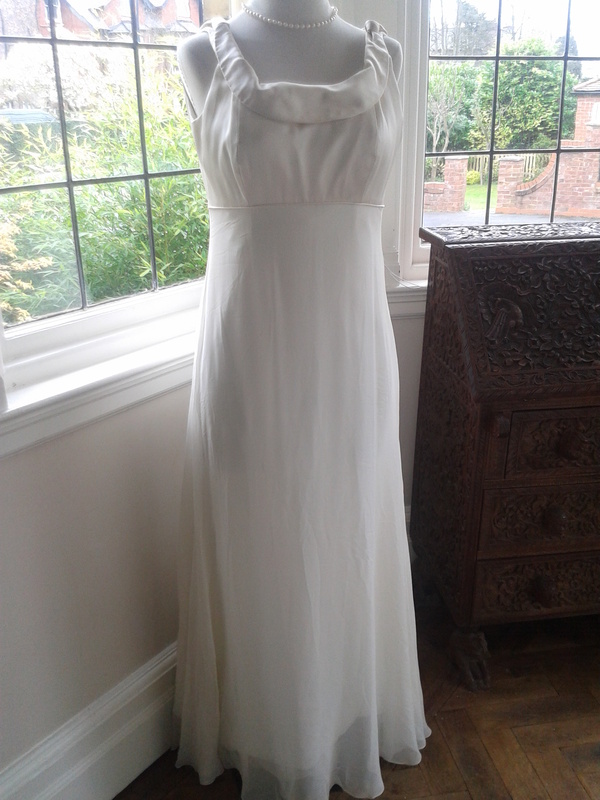 It’s never been worn, but worry not, nothing awful befell the bride to be, it was made as a sample, and for a smidgeon of the cost you can look like a Hollywood Star on your Wedding Day. Incidentally, the blog title is a favourite opening line of mine. Fellow bloggers, what’s your favourite opening line? Beautiful dress, just perfect !! Ohhhhh! There are just too many to list! I love opening lines; it is crucial for a writer to make that first sentence count. Opening lines, easier said than done. Love the Mitchell line, immediately attention grabbing. Thanks!